* INAUGURATION: It might be a challenge heading north out of the neighborhood on Jan. 20. Here's DDOT's page on the inauguration, with a map of the close-in detours and closings, and the pedestrian routes, and more. * TUNNEL OPEN HOUSE: The next Virginia Avenue Tunnel open house is Thursday, Jan. 12 (tomorrow), from 6 to 8 pm at the Courtyard Marriott at New Jersey and L, SE. "A brief presentation and Q&A session with residents will be held at 7 p.m., in response to requests from neighbors." Also, CSX says it expects to reopen 3rd Street at Virginia during the week of Jan. 23-27. After that, there will be another temporary closing of 4th St. SE at Virginia to move a utility manhole. And 7th should be reopening at Virginia Any Minute Now. What else is going on these days? Do we have a date for the opening of Whole Foods and why such a delay in the buildout? Is it me or does WCS Construction seem to take double the amount of time to construct its building compared to others in the neighborhood. 7th street was indeed open during my drive this morning! Hooray! Thank you for the updates. We are wishing the best for Mr. JD Land. I hope this new catcher we got is three quarters as productive as Ramos. His stats suggest he's quite up and down. I have a bad feeling about this odd year, but of course I'll still be next door cheering them on. Dude, the Nats are undefeated and in first place as I type this! @dude-- I don't know how Derek Norris will be this year (we miss you, Buffalo!) but at least the Nats will be in first in the NL East in facial hair with him and Jayson Werth. Not to get into a political discussion on this fine blog but if anyone wants to have solidarity happy hour next Fri. evening at Nando's, we'd welcome the opportunity to see more neighbors. Between Norris, Lobaton and (likely later in the season) Severino, I think the Nats are in good shape at catcher from the defensive standpoint (even though Ramos was somehow underrated as a defensive catcher). But it's unreasonable to expect any of those guys to compensate for losing Ramos (at least the pre-injury 2016 Ramos) at the plate. That offensive production is going to have to come from a full season of Turner (playing SS instead of Espinosa), Adam Eaton, and rebound seasons from Harper and (pipe dream?) Zimmerman. 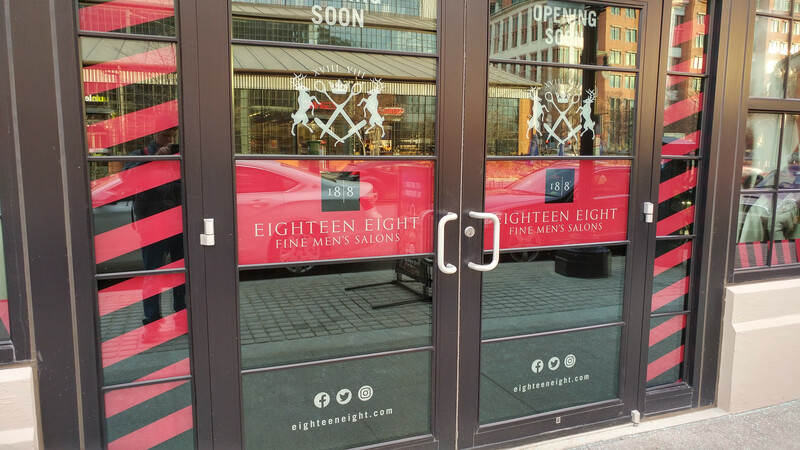 Looks like the fancy men's barber shop / salon is officially coming to the old Yards leasing center space. Conngs, I agree wholeheartedly. But can this team also cope with injuries that are bound to happen? Also, without a closer we will need to score 5-6 runs a game. Guess we'll see! @RMP: Going to go out on a limb and guess the haircut prices will be outrageous, unfortunately. If prices aren't posted (and I could find none on any of their other local location websites), it's probably more than I'm willing to pay for a haircut! Dude, I think the lineup has enough depth on the big league club as well as guys in AA and AAA ball to deal with the inevitable injuries, but yeah, I think 6 runs per game sounds about right. It's also going to be important when they score their runs. Seems like the Nats typically like to get a two run lead and then kind of give away at bats the rest of the game and lean on the starting pitcher. That can't really be the case next year if they expect to contend. I'm a little worried about the starting rotation holding up though. I was super disappointed to see that Roark is playing in the WBC the year after he reached a career high in innings. Seems insane to me (just as insane as Murphy playing after admitting that glute issue might be recurring). Strasburg has actually been pretty dependable inasmuch as his trips to the DL don't last too long and he comes back sharp. Hopefully he at least keeps that up. Ross is a huge question mark. That leaves Scherzer (still suffering from a stress fracture?!) and Gio as your most dependable starters. I think Gio as a fifth starter but he's not going to carry the staff for any stretch and he's unlikely to ever give the bullpen a night off. So it's not hard to imagine a 2016 Mets scenario where the starting pitchers drop like flies and the season goes down the drain. OT, but look what I found!